Two brothers, Prosper and Bo, escape from their aunt Esther, who had taken them in after their mother had died, to Venice to join a group of homeless kids living in an old theater. The kids include Hornet, Riccio, and Mosca. They are led by Scipio, the Thief Lord. Scipio is a mysterious boy who keeps his whereabouts secret and robs rich people and sells their loot to Barbarossa, a greedy antiques dealer. Scipio gives that money to the kids, who use it for daily use. Meanwhile, Esther hires a detective, Victor, to search for Prosper and Bo. Sometime later, Barbarossa tells Prosper that a mysterious man, the Conte, has a mission for Scipio to do. The kids meet the Conte in a church. He tells Scipio to rob a wing from Ida Spavento and offers lots of money. At the same time, the kids struggle trying to live and with confrontations with Victor while he is trying to take away Prosper and Bo. The kids later find out that Scipio is actually from a rich family and has never robbed anything in his life. Angrily, the kids set out to Ida house to do the mission themselves. They find Scipio there, and Ida captures them. She does not get angry at them, and tells them that the wing is from a magical, age changing merry-go-round and the Conte must have it. She will give the wing only if she can join the kids when they give the wing to the Conte and the kids must also follow him to his island. The Conte gives them fake money, so Prosper and Scipio go to the Conte’s island to confront him. Barbarossa comes and destroys the merry-go-round after becoming a child. The kids continue trying to fit to their new life. The book starts out very boring, and the plot is not very good. The plot starts to thicken towards the middle, and the conflict evolves, making the book more engaging to read. The author uses lots of good detail, which creates an image in my head and makes the story more humorous. Victor is the only person who changes. He becomes more soft and show mercy. A weakness in the book is that many parts are unrealistic and do not make much sense. In the story, the kids live in an empty theater, and nobody notices them. Also, when the police go to the theater and take away Hornet and Bo, they somehow do not care about all their items, and lots of money, and simply leave it all there. This book is best suited from children ages ten to twelve because the book is easy to read and understand, and the vocabulary used is not advanced. I would read this book again because the plot is very good and it makes me want to keep reading. I would rate this book eight out of ten stars because of the beginning and other boring parts. 1. Who hired Victor to try to find Prosper and Bo? 1a. Esther and Max Hartlieb, their aunt and uncle, did. 2. Who do The Theif Lord and his gang sell his stolen items to? 2a. They sell them to Ernesto Barbarossa, a fat man with a red beard and an antiques shop. 3. How do Prosper and Riccio escape when Victor sees them? 3a. They hide in an alley, escape to the Grand Canal, and get on a boat. 4. Why do Scipio, Prosper, and Mosca go to a confessional in the Basilica? 4a. They have to meet The Conte, a man who offers them a mission to steal his prized artifact from someone else for five million lire. 5. 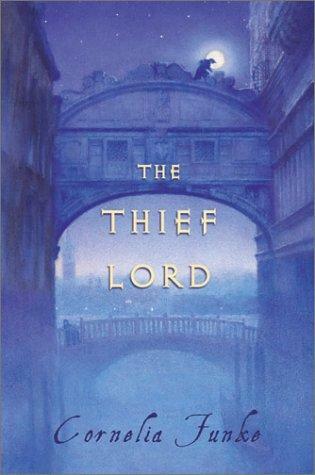 How do the Thief Lord and his gang escape when Victor follows them? 5a. Mosca escapes to their hideout with the Conte’s package and Scipio distracts Vicor with Prosper and Bo. Hornet later acts like Victor was trying to kidnap her and the gang escapes while bystanders beat Victor up. pgs. 1. What do the kids do with Victor when they catch him snooping around the theatre? 1a. They beat him, tie him up, and lock him inside the men’s bathroom. 2. How does Riccio manage to get into Signora Ida Spavento’s house? What does he find out there? 2a. He purposely crashes into the housekeeper, who is holding bags of food. He acts like a gentlemen and carries her bags into the house, and then looks around the house and finds out that the doors aren’t properly locked up. 3. What is the wing that the kids are supposed to find originally part of? 3a. It was part of a magical merry-go-round which could turn an adult to a child and a child to an adult. This merry-go-round was owned by the Merciful Sisters. 4. What island does the Conte lead Ida and the kids to? 4a. He leads them to Isola Segreta, the Secret Isle, which is supposed to be bewitched. 5. Who does Prosper think told the police about their secret hideout, which resulted in Hornet and Bo getting taken away? 5a. Prosper thinks that Victor must have broken his promise to not tell anyone about their hideout and told the police. 1. How do Ida Spavento and Victor get Hornet out of the orphanage? 1a. They act like Hornet is a runaway girl and that they were trying to look for her. Because Ida Spavento donates lots of money to the orphanage, they let her take Hornet away without asking questions. 2. Where does Victor find Bo after he ran away from Esther? 2a. Victor finds Bo hiding in the Stella, the children’s former hideout. 3. Who breaks the merry-go-round? How did he/she break it? 3a. Barbarossa, who had sneaked on the Isla Sergata, demanded that he ride the merry-go-round. Scipio and Prosper push him many times on purpose to make him young, and in an attempt to stop the ride, Barbarossa kicked the lion and its wing fell off. 4. What does everyone decide to do with Barbarossa? 4a. They decide to get him adopted to Esther, because Barbarossa is very neat, which Esther would like, and also Esther would like the way he talks. 5. What does Scipio want to do now that he is an adult? He wants to do something exciting and adventurous, so he wants to be Victor’s helper in his detective work.